Dovetail Drawer Boxes | Woodworkx Unlimited Inc. Kitchen cabinet drawers are opened and closed thousands of times per year. At Woodworkx, we are conscious about this. This is why our drawer boxes are built to last! Due to its strength, we implement the dovetail joint or locking joint to construct our drawer boxes. Furthermore, this type of joint helps maximize drawer storage space. Due to its strength, hardness, and durability, we utilize maple wood to construct our dovetail drawer boxes. 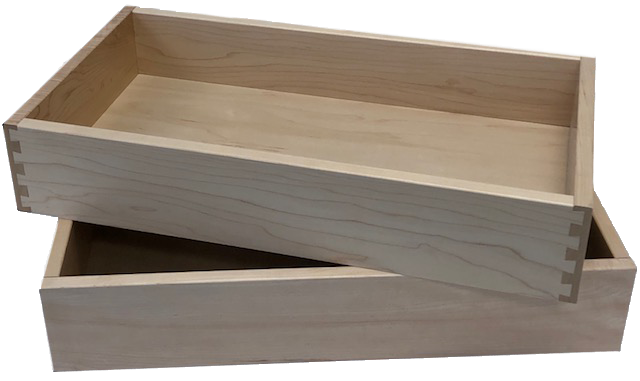 You can select from 1/4″ or 1/2″ maple wood for the bottom thickness of your drawer boxes. Upon request, we can notch your drawer boxes for bottom rail installation. We offer a one year warranty on our dovetail drawer boxes.